Who: Children and adults will participate in Special Olympics New Jersey events; other members of the public are invited to cheer them on and later, to view the Vince Lombardi Trophy. President Herman Saatkamp of The Richard Stockton College of New Jersey will welcome participants, while Mrs. Dot Saatkamp will join the 3K run/walk. What: Special Olympics New Jersey will hold fund-raising events including the “Jingle All the Way” 3K Fun Run/Walk and a floor hockey tournament at Stockton. Participants and later the public will have access to the “Join the Huddle” tour’s “Huddle Shuttle” containing the Lombardi Trophy awarded to Super Bowl champions. The 18-wheeler also contains a locker room filled with sports memorabilia, including lockers belonging to Giants quarterback Eli Manning and former running back Curtis Martin, who played for the Patriots and Jets. Families can also participate in fun drills such as a “snowflake toss” and play video games. The “Join the Huddle” tour is the first-ever mobile tour associated with a Super Bowl, which is traveling throughout New Jersey and New York, ending with a stay on Broadway in New York City from Jan. 29-Feb. 1. The appearance at Stockton is the farthest south the tour has come. When: Saturday, Jan. 11, 2014, starting with registration at 10 a.m.; opening ceremonies at 10:30 a.m.; the 3K Fun Run at 11 a.m.; exclusive participant access to the “Huddle Shuttle” containing the Vincent Lombardi Super Bowl Trophy from 11:30 a.m. – 1 p.m.; and public access to the “Huddle Shuttle” and trophy from 1- 2:30 p.m.
Where: In and outside the Sports Center on the college’s main Galloway campus. The “Jingle All The Way’’ 3K Fun Run/Walk will start and finish in Parking Lot 6. The course route will loop around Lot 7, go down Lakeside Lane Service Road, around the flag poles at the Arts & Sciences Building and then back down Lakeside Lane, ending in Lot 6. Runners and fans are also invited to come inside the Sports Center post-race for refreshments and to watch the Special Olympics New Jersey Floor Hockey Tournament. The Huddle bus will be in Lot 5. Additional information: The funds raised through this event will help advance the goal of Special Olympics New Jersey, to provide free year-round training and competition in 24 Olympic-type sports to more than 23,000 children and adults with intellectual disabilities. The fee is $30 to pre-register for the walk/run; for children under 10, the fee is $15. 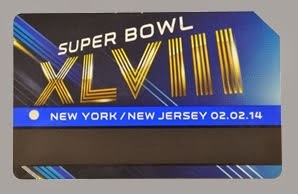 Contacts: Media may contact Alexandra Sturm at asturm@rubenstein.com prior to the day of the event for more information on the NY/NJ Super Bowl Host Committee’s “Join the Huddle” tour, sponsored by P.C. Richard & Son, a chain of electronics and appliances stores. For more information on Special Olympics New Jersey, click here. To register for the event at Stockton, click here.